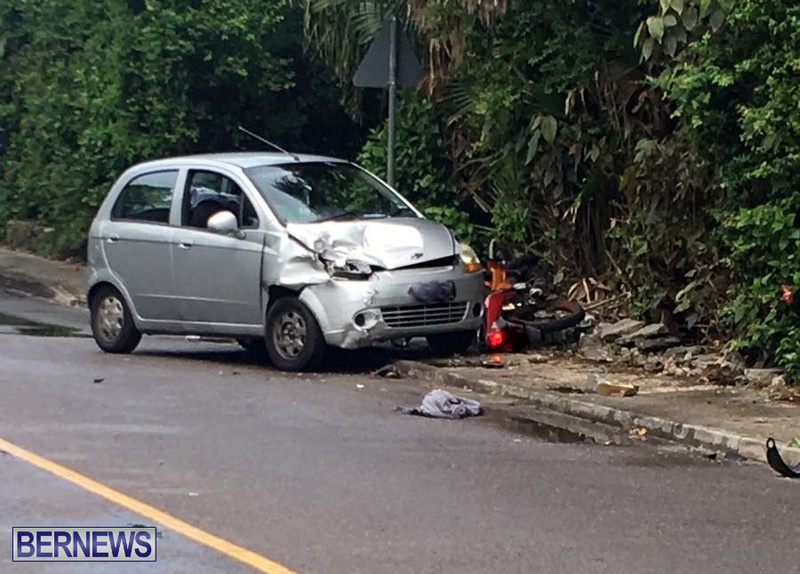 A 19-year-old man injured in a collision yesterday [July 1] in Paget has been airlifted overseas for further medical treatment, the police have confirmed. A police spokesperson said, “At last check this afternoon [July 2nd] a 19-year-old Sandys parish man who was injured as the passenger on a motorcycle involved in a collision with a car on South Road in Paget near the entrance to Elbow Beach around 10am Sunday, July 1st was airlifted overseas for further medical treatment after initially being admitted to the hospital’s Intensive Care Unit – while the rider, a 49-year-old Sandys parish woman, was treated for serious leg and foot injuries and was recovering in stable condition on a general ward at King Edward VII Memorial Hospital. “The male driver of the car did not leave the scene and was not arrested following the collision. However, the scene was processed and both vehicles involved have been impounded pending further inquiries.